57hp Front Steering, Bi-Directional Alpine Tractor. 2 years warranty. The TRX 6400 has been fitted with a new low-noise and ecological 57hp turbo engine delivering a brilliant torque even at low revs. This new reversible isodiametric model in the Ergit Series is available with many optional accessories, such as the new safety chassis comprising a half cab with 6 uprights (called EasyStar), the new power lift with suspension and the Multifunction Joystick JM™ with doubled oil capacity. The ergonomic, comfortable, safe and moderately priced EasyStar half cab does not limit working space or comfort, even in reverse gear, and assures elevated operating safety on steep slopes in both directions of travel. 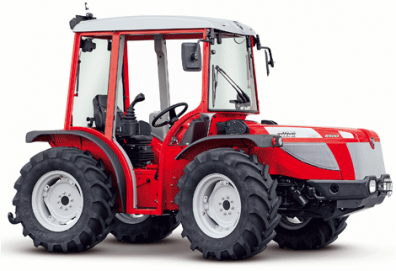 The new tractor is fitted with an Actio™ chassis (Full Chassis with Oscillation AC) featuring a lengthened wheelbase that assures greater stability and constant adherence to the ground, as well as greater practicality in the use of demanding rear and/or front equipment which can also be mounted at the same time. 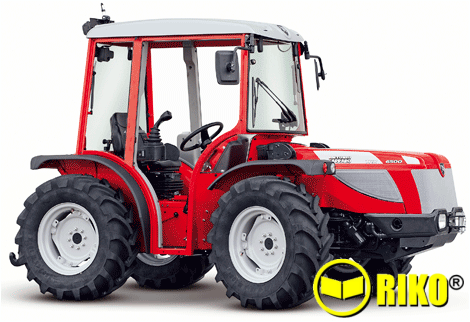 The TRX is a fast, nimble and versatile tractor, capable of achieving high workloads.